If you were about to sit down and write a historical espionage thriller what better setting could you imagine than Paris following the Great War. Paris, 1919 with historical characters ranging from Ho Chi Minh to Woodrow Wilson all together in the city of lights, trying to redraw the boundaries of defeated empires and bring about self-determination is an amazing setting. It is on this stage that Robert Goddard has created an engrossing tale entitled, THE WAYS OF THE WORLD. Goddard has written over twenty historical novels, and this is my first exposure to his writing and it will not be my last. We first meet the protagonist, James Maxted, a former flying ace for the Royal Flying Corps (RFC) during World War One, who spent the last eighteen months of the war in a German POW camp after being shot down, trying to set up an aerodrome business with his wartime compatriot Sam Twentyman. During negotiations he receives a message from his mother that his father has been killed in Paris. Sir Henry Maxted, a career British diplomat who served in Russia during the revolution, Brazil, and Japan among many postings was part of the British delegation to the Versailles Conference. The French police under pressure from the British government rule Sir Henry’s death was accidental and from this point on the story line begins to evolve. After going to Paris with his brother Ashley, James, known as “Max” does not accept the French police’s conclusion that his father suffered an accidental death when he supposedly finds his mistress having a liaison with a French artist, and falls off a roof peering into the Frenchman’s apartment. For Max, his father’s honor is of the utmost importance and he is on a quest to learn the truth. His older brother, now, Sir Ashley, does not want to make waves, and under the influence of his scheming wife, Lydia wants to accept the findings of the French police and move on and collect his inheritance. Sir Ashley informs his brother that the land he was promised by his father for his aerodrome venture would not be forthcoming if he pursued his own investigation of his father’s demise. From the outset the family setting and some of the characters seem to have been borrowed from a Downton Abby script, but about a quarter of the way into the book matters become very serious and British officials are very clear they do not want Sir Henry’s death to create a scandal at Versailles that could ruin the tenuous negotiations that are taking place. Goddard creates a number of interesting characters apart from the Maxted family members. There is Travis Ireton, a supposed American friend of Sir Henry, who traffics in obtaining information concerning peace negotiations and selling what he learns to interested parties. Madame Corinne Dombreux, a French woman who had been married to a spy during the Russian Revolution. Now a widow she had been Sir Henry’s mistress, and she too questions Sir Henry’s supposed accident. Senor Baltazar Ribeiro, a Brazilian diplomat who knew Sir Henry well and worked with him to settle Brazilian and allied disagreement as to how many German merchant ships should remain in the Rio government’s control. Fritz Lemmers, the fugitive head of the German Secret Service who is working behind the scenes to foster German interests by recruiting spies all over Europe and had been an attaché in Tokyo in the 1890s when he Sir Henry was posted there. Masataka Kuroda, a Japanese official who knew Henry in 1891 at the time of the plot to assassinate the Tsarevitch during a visit to Tokyo. Nadia Bukayeva and her uncle, leaders of the trust, a group bent on restoring the Russian monarchy to the throne after the revolution. In addition, there are numerous others ranging from American, French, and British secret police to Maxed family members who will provoke the reader’s interest. All developed well by Goddard, and each makes an important contribution to the ever complex plot. When it seems that the closer Max gets to the truth, the more people with important information die. It is important to keep in mind that the novel is taking place during the Versailles Conference. The atmosphere is intense because so much is at stake for so many nationalist movements and countries. Things became even more problematic as the major powers, the US, Italy, France and the UK decide that they will make the “major” decisions to the exclusion of Japan. Goddard blends this atmosphere well with his plot concerning Sir Henry’s death, the chicanery that is the Maxted family as Sir Ashley tries to protect his selfish interests, Max’s pursuit of the truth and where it leads him, and the ultimate result of his investigation. My only disappointment came when the book came to an end rather abruptly. However, once you turn the final page you learn that the second installment of Goddard’s’ worldwide trilogy, THE CORNERS OF THE GLOBE continues the story. For me, I cannot fathom where Goddard will take the story next. I am always amazed when an author can come up with a new concept to explore in the mystery/espionage genre. 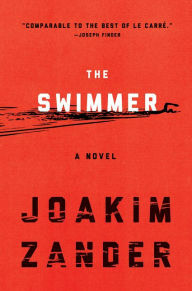 One country that seems to keep producing such authors is Sweden, and alas they have done it again with Joakim Zander. The author has lived in Syria and Israel and earned a law degree in the Netherlands and spent his career as a lawyer for the European Union in Brussels and Helsinki. This background contributed greatly to his first novel, THE SWIMMER that has been greeted with great acclaim. The story line is somewhat different as Zander explores the role of American outsourcing of prisoner interrogations in Iraq and Afghanistan. Zander creates a “Blackwater” type of organization that he calls “Digital Solutions,” which seems to be a dummy company that was kept heavily in the “shadows” to maintain deniability and protect those in charge. The leaders of Digital Solutions become aware that there is evidence of their “enhanced interrogation” techniques, i.e. ; torture at the time of the Abu Ghraib fiasco and they will do anything to get control of the evidence. The scenario is believable and Zander has complete control of the political and diplomatic history that is involved. An interesting example is his suggestion through his characters how the first Bush administration treated the Kurds in 1991. The CIA agent leads his Kurdish allies to believe that American help will be forthcoming to protect them for Saddam Hussein’s revenge. As history has shown that protection never was provided and the Bush administration allowed Saddam’s forces to crush the Kurds, probably employing chemical weapons. These types of observations reflect the strong political views that Zander holds that appear throughout the book. The story centers on a number of interesting characters. As Zander develops them he does so in a very slow methodical fashion particularly the CIA operative who spends a good part of the book in search of his daughter who survived a terrorist explosion in Damascus in 1980. The most important characters are Klara Walldeen, a political aide to a member of the European Union Parliament in Brussels and a former boyfriend, Mahmoud Shammosh, a Ph.D candidate whose dissertation dealt with the privatization of war, who involves her in the scenario where explosive evidence of what Digital Solutions is guilty of exists. Another interesting character out of the Stieg-Larsson mold is “Blitzie,” a skinny teenaged hacker who will present a number of interesting surprises. The reader is taken into the world of the CIA and its outsourced programs and what they are capable of doing if things do not go as planned. The reader is also exposed to the world of lobbyists to the European Parliament and the influence which they possess. One member of a lobby firm, George Loow is also drawn into the tentacles of Digital Solutions and it is through him that Zander triers to create an effective morality play which sometimes is effective. The plot revolves around a number of storylines that shift back and forth from the 1980s and Christmas, 2013. At times this can be confusing as Zander does not integrate his CIA operative in search of his daughter as effectively as he might have. What does wonderful historical fiction, Sherlock Holmes, Henry James, members of the Adams dynasty, anarchism, and numerous late 19th century historical figures and events add up to? The answer is a marvelous new novel by Dan Simmons, entitled, THE FIFTH HEART. Having just taken in the film, MR. HOLMES I have become fascinated by the character of the “great detective.” In his own mind he seemed to wonder whether he himself was real, or a fictional construct of Arthur Conan Doyle. It really does not matter whether these ruminations that appear throughout the book are true as Simmons has taken the friendship embodied in the American “salon” that included Abraham Lincoln’s personal secretary and William McKinley and Theodore Roosevelt’s Secretary of State, John Hay and his wife Clara; Henry Adams and his spouse, Clover; and the noted geologist and explorer Clarence King called the “Five of Hearts” and turned it into a remarkable mystery that centers around a plot to assassinate President Grover Cleveland, and numerous other politicians and government officials designed to create the conditions for a massive revolt on the part of the lower classes to overthrow the then existing power structure. Simmons’ methodology is based on assiduous research, strong character development, and a plot that may not have been that farfetched in 1893 because of the earlier Haymarket Massacre in Chicago. The novel opens with a supposed chance meeting between Sherlock Holmes and the American writer, Henry James along the banks of the Seine River in Paris. It seems that James is contemplating suicide over the poor sales of his novels and short stories along with his inability to become a successful playwright. Holmes, who is bent on keeping a promise to the brother of Clover Adams concerning her suicide convinces James to accompany him to America and serve as his foil in the way that Dr. John Watson had done in the many cases that made Holmes famous. From this point on the novel takes off and along the way the reader meets Samuel Clemens, Henry Cabot Lodge and his wife Nellie, Theodore Roosevelt, William Dean Howells, Oliver Wendell Holmes, and numerous other historical figures. Simmons’ historical references integrated into character dialogue are impeccable. Simmons has an excellent eye for historical detail as he describes how New York evolved from a semi-rural grouping in the 1840s to an immigrant infused city of Jews, Irish and Italians, each with their own niche in society. His description of the Washington, DC of the 1890s is very accurate. From the foliage, architecture, boulevards, and slums of Foggy Bottom. His description of Chicago and the Columbian Exposition are also accurate in detail and in part replicate Erik Larson’s THE DEVIL IN THE WHITE CITY. What is astonishing is Simmons’ imagination and ability to connect the dots in his plot that though the story is fiction, it is in part quite plausible. The idea that Clover Adams’, a woman who suffered from melancholy and depression did not commit suicide and was murdered is in some way connected to an anarchist plot seems way off base until the author develops his story and with how events and characters come together, it may be possible. It is fascinating how Simmons develops the Holmes/James relationship and their views about society in general. What is most curious is how James goes from complete distrust of the English detective to reliance on his logic, and how at times each seems to be investigating the other as they try to make sense of their relationship. The scenes involving the two are “precious” as are the interactions and word play between the characters and their views on race, Jews, and the origins of American anarchism. What emerges is that the coterie of individuals that Holmes and James must deal with runs the gamut from criminals and murderers to the intellectual circle that is the center of the Hay/Adams salon, a quite diverse grouping! 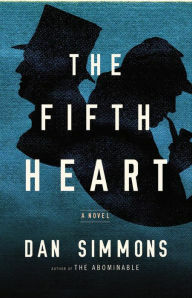 The interplay of Holmes’ constant speculations intertwined with his investigation of Clover Adams’ death and the plot to assassinate President Cleveland accentuates the richness of the story line and makes THE FIFTH HEART a wonderful read. The only caveat that I would bring to the table is that the novel is quite long, and at times Simmons can meander away from what appears to be the core of the novel, but he always seems to pull things together to engross the reader even further. Postscript: If you have ever read Phyllis O’Toole’s THE FIVE OF HEARTS you will appreciate Simmons’ ending.